That is why the gift of Katadyn will be perfect for the fathers who love the outdoors. Not only are they proven and durable, but will provide you with one of the most crucial elements on Earth: clean, pure drinking water. That is exactly what the Katadyn Pocket Microfilter is good at. It is the most rugged, longest lasting microfilter available and is backed by a lifetime warranty. The Pocket Microfilter features a solid design and construction that makes it perfect for continual use, even under extreme circumstances. 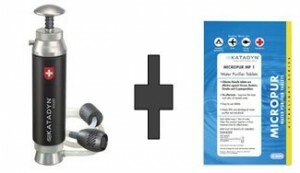 This also makes this emergency water filter great for use in times of need. This Microfilter comes with the Katadyn exclusive silver impregnated ceramic cartridge that protects against bacteria and protozoa and lasts up to 13,000 gallons. If you act today, you can take advantage of a FREE gift with purchase. When you purchase a Katadyn Pocket Microfilter from June 1st – June 15th, you will receive a FREE� 20 pack of Micropur MP1 Emergency Water Tablets. These emergency water tablets are for the disinfection of drinking water. When used as directed, the Micropur MP1 tablets make contaminated water suitable for drinking. Micropur MP1 water purifier tablets are used by campers, hikers, militaries, emergency organizations, relief workers and anyone who may need to drink water of questionable quality. Stop worrying about what to get that special man in your life for Father’s Day this year. Katadyn is perfect for the outdoor enthusiast and with its design and effectiveness it is also great for anyone who values clean, pure drinking water. Remember, the special gift with purchase lasts June 1st� – June 15th and while supplies last so hurry and act today!